Magnum Options is using the SpotOption trading platform, considered to be one of the most common trading platforms for binary options because of its ease of use and flexibility. 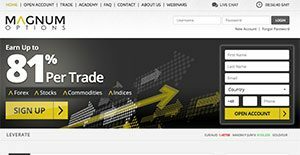 It is so easy that even inexperienced traders won’t find themselves having a hard time browsing and performing trade tools and processes present at SpotOption. Magnum Option’s trading platform has notable features such as “Close Now” or “Extend” giving traders the ability to halt transactions or stretch them as they see fit. It is essential to keep in mind that almost no service in the Binary Options Brokers category is an ideal solution able to fulfill all the requirements of all investors. It may be a good idea to read a few Magnum Options reviews first as specific solutions may actually perform well exclusively in a specific geography or situation or be prepared with a really specific customer in mind. Others might operate with a goal of being easy and intuitive and therefore lack complicated functionalities welcomed by more experienced users. There are also services that cater to a large group of users and provide a rich feature base, but that in most cases comes at a more expensive cost of such a solution. Make sure you're aware of your needs so that you get a service that provides exactly the functionalities you search for. We realize that when you make a decision to buy Binary Options Brokers it’s important not only to see how experts evaluate it in their reviews, but also to find out if the real people and companies that buy it are actually satisfied with the product. That’s why we’ve created our behavior-based Customer Satisfaction Algorithm™ that gathers customer reviews, comments and Magnum Options reviews across a wide range of social media sites. The data is then presented in an easy to digest form showing how many people had positive and negative experience with Magnum Options. With that information at hand you should be equipped to make an informed buying decision that you won’t regret. What Bonus Does Magnum Options Offer? While Magnum Options started its operations in the second half of 2013, its lack of operational history is offset by its broker technical competencies, particularly in the aspects of customer support and security. Round the clock availability of its customer support channels and a number of different methods enable Magnum Options to separate itself from the saturated market of binary brokers and make them a viable choice for new traders who are searching to get a thorough understanding of how the platform operates. If you need more information about Magnum Options or you simply have a question let us know what you need and we’ll forward your request directly to the vendor.